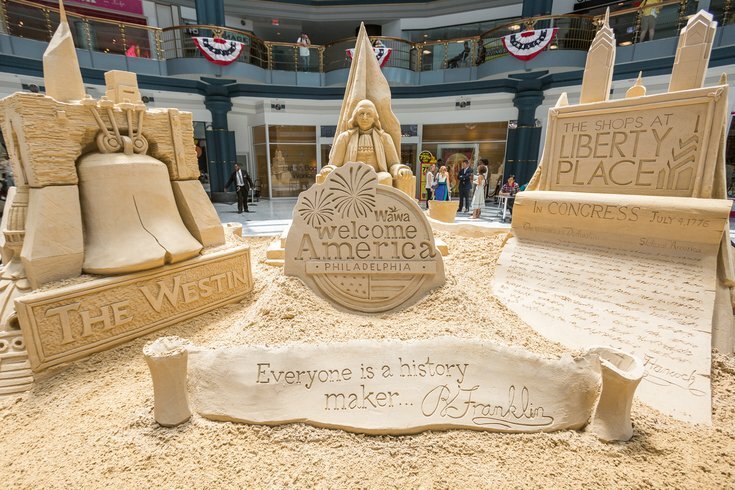 Sand sculptures were unveiled on Monday, June 26, at the Shops at Liberty Place for the official kickoff of the Wawa Welcome America Festival. Don't run around it. Don't try to add to it, and certainly, don't try to knock it over. These sand creations are for looking, only. The chitchat surrounding Wawa Welcome America has been abuzz for weeks now, but it required the unveiling of three giant sand sculptures at Liberty Place to mark the official kick-off of festivities Monday and put the party really into motion. Sand sculpting displays made their debut 25 years ago – at the start of Welcome America in Philadelphia – and have been a tradition ever since. They’ll be on display inside the Rotunda at The Shops at Liberty Place throughout the month of July. On June 20, the city put two South Jersey sand sculptors to task in transforming the Rotunda at Liberty Place into a giant sand sculpture. Using 40 tons of sand brought in from South Jersey, two men created hand-carved scenes depicting Philadelphia icons, historic figures and treasures Ben Franklin, the Constitution, Betsy Ross, the LOVE statue and more of the like. But ask the architects of the massive earthen carvings, and putting it all together was not easy. “Many masonry tools were used to carve out each detail of the sculptures – cake decorating tools, forks, knives, hands,” said John Gowdy, who originally hails from Atlantic City and now lives in Italy. It took him and Matthew Deibert, of Smithville, N.J., a week to craft the entire thing. “We had to squeeze a lot of stuff in. Philadelphia has a lot of history. They wanted patriotic, and Philly is the place for patriotic,” said Gowdy. As for increased security measures around the sand sculptures, there isn’t too much the city can do except ask Philadelphians to kindly respect the work that was put into the art form. A barrier will be placed around the sculptures while it’s up throughout July and an extra security guard will be on hand, should those pesky flash mobs – or anyone else – get any rash ideas. 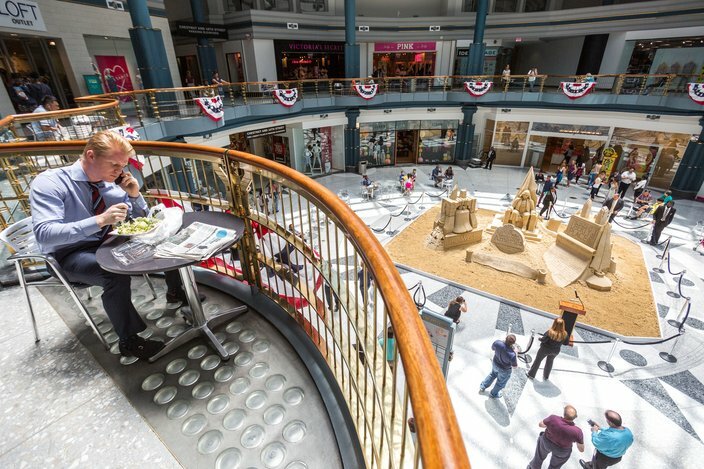 The Rotunda of the Shops at Liberty Place has a new temporary installation - a sand sculpture that was unveiled Monday, June 26, as the official kickoff of the 2017 Wawa Welcome America Festival. Now celebrating its 25th year, this year’s Wawa Welcome America theme is “Everyone is a History Maker." It aims at encouraging participants both young and old to be just that. “Everyone is welcome and everyone is valued and no matter what you do in your life, you can make history,” said Jeff Guaracino, President and CEO of Welcome America. Founded in 1993, Welcome America Inc. puts on the annual Wawa Welcome America festival, which prides itself on being the nation’s premier 4th of July celebration. It’s a six-day, citywide festival comprised of 50 free events, world-class fireworks displays, outdoor movie screenings, free days at city museums, community events, play days for kids and much more. "When you think of July Fourth, you think of Philadelphia first," Mayor Jim Kenney said. "With our history and iconic beauty, Wawa Welcome America showcases our nation's birthplace – from the patriotic pageantry on the most historic square mile in America at Independence Mall to the fantastic fireworks over the Rocky steps of the Benjamin Franklin Parkway."